First, here are a few examples of sounds generated by this model. 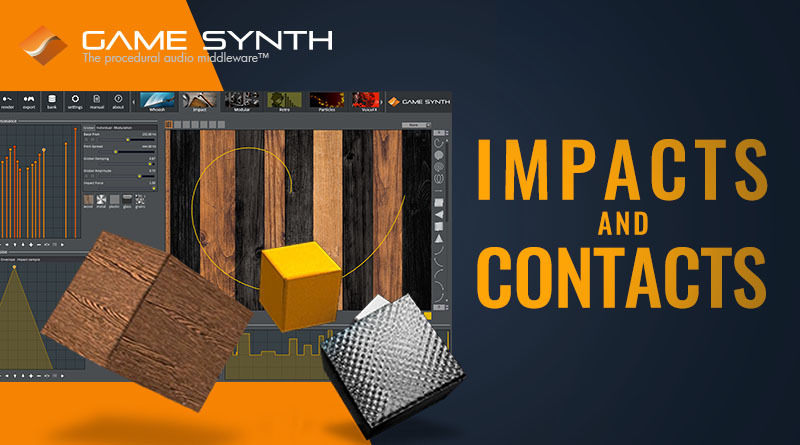 Keep in mind that you can apply random ranges to the model’s parameters and ask GameSynth to create hundreds of variations of an impact in one click for example! Also, the sounds below have not yet been layered and no effects or processing have been applied. In GameSynth, you can of course add effects and layer patches of different types with the patch player module. The left part of the screen is dedicated to the creation of materials for the impacts, while the right part allows you to design surfaces to make contacts with these materials. This first section lets you build the resonant part of the impact. This is the sound that is produced when solid objects made of metal, plastic, glass, wood etc. are hit and are vibrating. 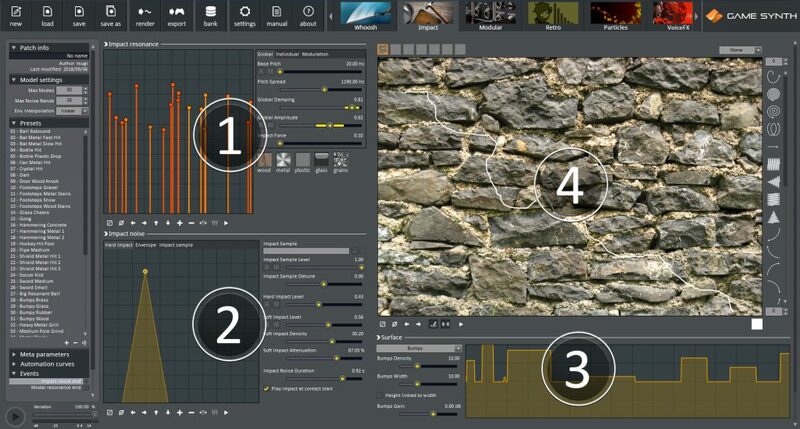 You can quickly create a new material by using one of the presets. If needed, you can then edit the resonant modes that were generated. You can also create a new material from scratch by adjusting the number of modes and their individual amplitude, damping and pitch. Once the material created, adjust the general pitch (to affect the size of the object), its damping (for dull or more resonant objects), the strength of the impact and so on. Playing with the modulation parameters can also add some interesting depth to the vibration or even a cartoonish feel to the sound generated. It is also possible to create a material by extracting the resonant modes from an existing sound. Simply drag and drop a wave file onto the material editor to do so! The impact noise corresponds to the initial thump of the impact and simulates the non-resonant part of the sound. If an object is only slightly resonant, this part will provide the main part of the sound. It can be built from several sound sources: a set of band-limited noise generators for a hard impact, a granular noise generator for a softer impact, or even a short sample. Once a material has been defined, generative algorithms can be used to design different surface types. Together with the materials, these surfaces can simulate a number of physics-based interactions. For example, the “Bumpy” surface algorithm is perfect for scraping sounds, and by adjusting the settings of the smooth surface algorithm, various rolling and sliding sounds can be generated. Like all the other GameSynth models, the Impact / Contact model provides a sketch pad to add life to your sounds by “drawing” them. Position, speed and even pressure – when using graphic tablet for example – are all taken into account, which gives amazing results for contact sounds! Moreover, it is possible to load a picture in the background of the sketch pad: the color of the pixel under the mouse / pen will be used as an additional source of modulation. For example, the brightness of the picture can modulate the contact sound. By designing your pictures carefully, you can create all kinds of different contacts! As mentioned earlier, once you have designed your patch, you can assign random ranges to its parameters and create hundreds of variations of your impact or contact in one click. These sound files can also be automatically imported into your game audio middleware (Wwise, FMOD Studio, ADX2 or even Unity) by GameSynth, which will also create all the containers, events etc. This concludes our post about the Impact / Contact model of GameSynth. 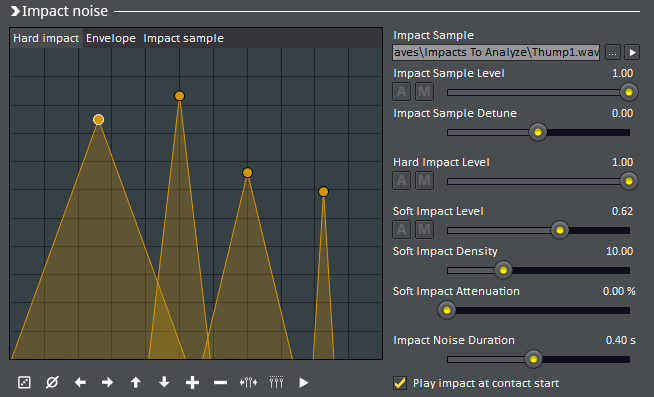 Generating high-quality impact and contact sounds for your game has never been so much fun! And don’t forget that GameSynth is 25% off until the end of this month (September 2018)!